The government of the Democratic Republic of the Congo (DRC) has announced the end of the latest Ebola virus outbreak, 11 weeks after its declaration in the northwest Province of Equateur. The DRC Ministry of Health, UNICEF, World Health Organization and other partners worked jointly to help stem the spread of the disease. The outbreak — the ninth in the DRC since the discovery of the Ebola virus in 1976 — began on May 8 in the Bikoro Health Zone. UNICEF teams in the DRC immediately mobilized to help contain the disease, with a focus on protecting children. UNICEF coordinated with partners to protect the water supply, promote hygiene to prevent the virus from spreading, provide counseling for families affected by the epidemic and vaccinate those who might have been exposed. The disease takes its name from the DRC's Ebola River, which runs beside the village where the first case was reported. Ebola is spread primarily through contact with the bodily fluids of infected people, and kills about half the people it infects. Children are some of the hardest hit by the virus. Mortality rates are as high as 95 percent for children under the age of 1. The 2014-16 Ebola outbreak in West Africa was the worst in history, with more deaths than all other outbreaks combined. Nearly one-fifth of those infected were children. 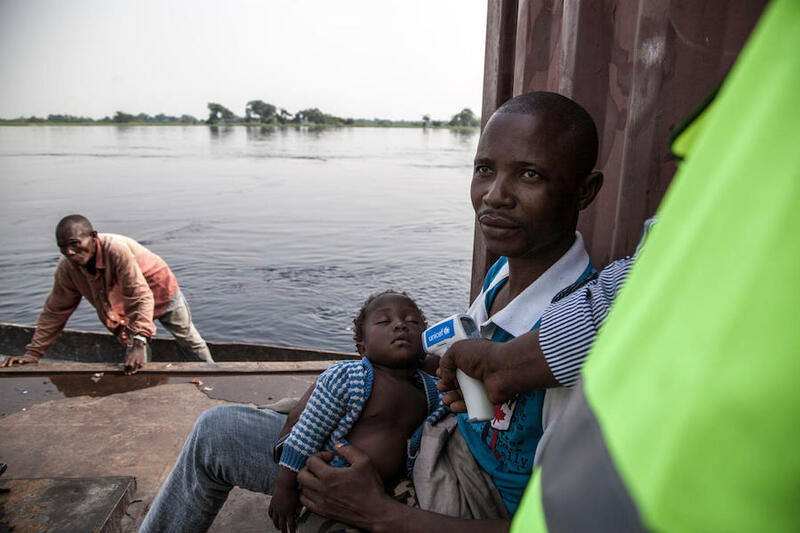 Above, a baby has his temperature taken with a UNICEF-provided infrared thermometer in the main port of Mbandaka. 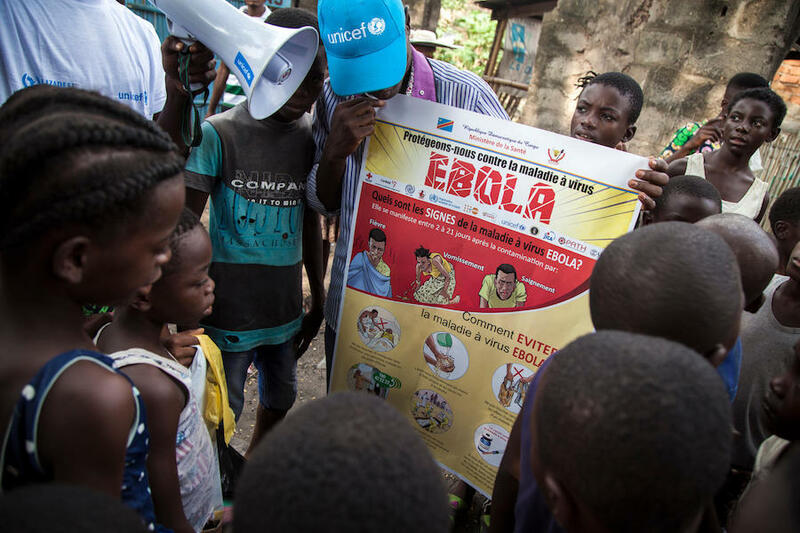 UNICEF supported a public awareness campaign in the DRC to teach children and families how to protect themselves against Ebola at home and in public places. Hundreds of community health workers fanned out to educate the public about preventing the disease. UNICEF also trained young reporters to provide peer-to-peer information on the importance of good hygiene as a way to avoid spreading Ebola. 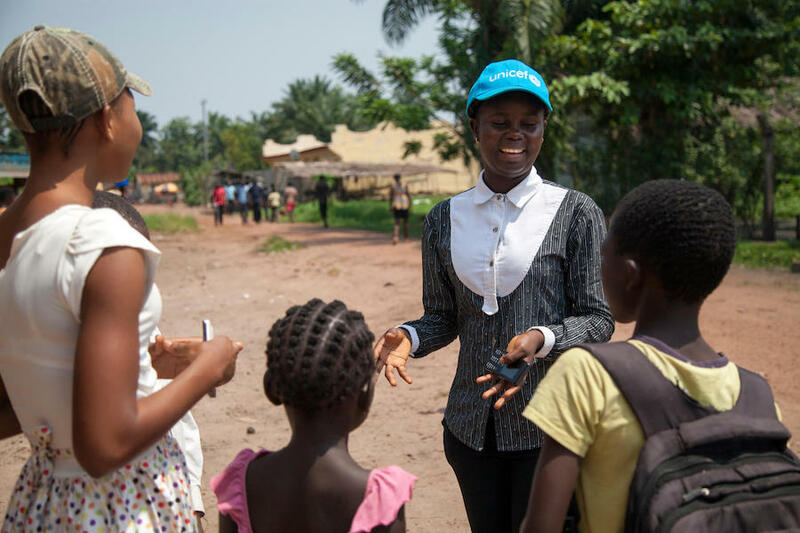 Above, UNICEF-supported radio reporter/educator Hornelie, 17, talks to children in Mbandaka. UNICEF also supplied water purification tablets to treatment centers, installed disinfection points in health facilities and set up handwashing stations in dozens of schools. 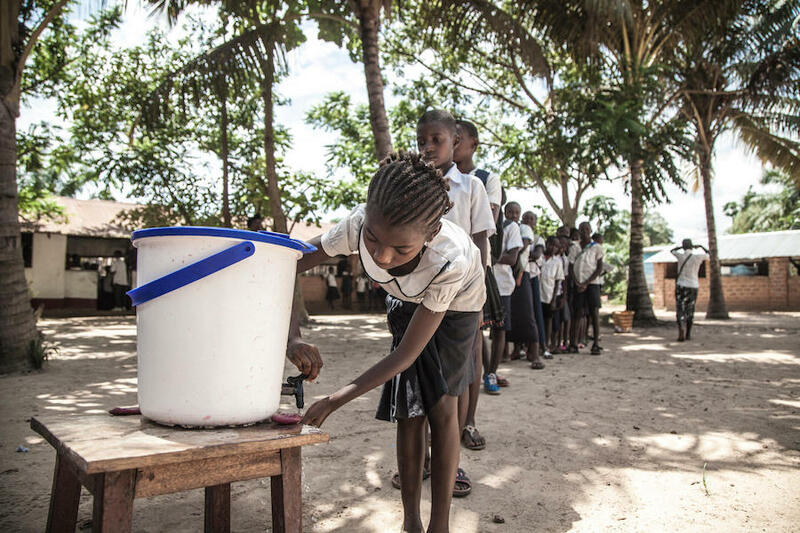 Schools are where children learn how to protect themselves from Ebola through handwashing and avoiding unnecessary contact. UNICEF-supported social mobilizers spoke with groups of children to share information on how to avoid contracting the deadly virus. Children then shared what they'd learned with families and neighbors. "It is thanks to the cooperation of all the partners under the coordination of the Government of the DRC that we've been successful in mobilizing communities to adopt behaviors and practices to contain the disease," says Gianfranco Rotigliano, UNICEF Representative in the DRC. "But we have to stay vigilant against future outbreaks by strengthening surveillance systems. Communication and community engagement efforts are also essential to avoiding and controlling new epidemics in the region." UNICEF has mobilized nearly $10 million of its own funds for its response to the epidemic, with funding support from many donors including the Governments of the United States, Japan and Canada, as well as the World Bank, European Union, Mercury Funds, CERF and GAVI. UNICEF responds to emergencies all over the world. Please support UNICEF's Emergency Relief Programs.